13 Nights and 14 Days 4* Accommodation in double rooms on twin sharing basis. All sightseeing tours as specified in the Itinerary. 1 Full Day Sightseeing at Pachmari by Gypsy with Parking Entrance Fee. 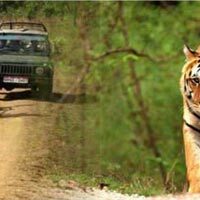 1 Jungle Ride at Kanha National Park by Gypsy with Parking Entrance Fee. All transfers as per the itinerary.Any Air Fare/Train fare/Helicopter fare. After breakfast, Visit half day city tour includes the massive sandstone fort doting the city skyline, the 9th Century Teli Ka Mandir and 11th Century Sas-bahu ka mandir Evening free Overnight at Gwalior. After breakfast, Full Day Sightseeing of Khajuraho i.e Kandariya Mahadeo Temple, Chaudsath Yogini, Chitrgupta etc. Overnight stay at hotel. After Breakfast Sightseeing of Jata shankar, Church, Bee- Fall, Bal Udayan, Vaniki Sangrahalya, Jheel(Lake), Dhuph gharh(Sunset) Pandov Gufa, Apsara vihar, Rajat prapat or Chougarh,Handi Khoh Dhupgarh Overnight stay at the hotel. After breakfast, Proceed to Bhopal Enroote visit Bhojpur and Bhimbetka caves. In the evening free time for leisure. Overnight stay at hotel. Morning departure to Ujjain..Arrival to Ujjain Check in to Hotel – In evening visits to some Temples Bade Ganeshji Mandir, Harsiddhi Temple, Sandipani Ashram etc. N/s at Hotel in Ujjain. Early Morning visit to Mahakaleshwar Temple to attain the “Bhasm Aarti” & After noon Drop to Railway Station.